Nanny Poppinz recruits, evaluates, and refers the finest quality Nannies to each of our clients in Boulder along with our Denver Colorado Nanny Agency. It is thrilling to offer parents a Nanny childcare option that they may not have considered before. Nanny Poppinz understands that childcare needs don't just happen from 9 AM to 5 PM; thus, we offer 24 hours a day, 7 days a week Nanny referral services. Our Nanny child care service will match the unique needs and expectations of your family with our qualified Nannies and then schedule them for you to interview them at no upfront cost. Once a confirmed match is made you will be charged a Nanny referral fee. Our intent is to give Boulder and Denver families peace of mind with your childcare selection so you can work, travel, entertain, or just have fun while your children are receiving the quality, loving childcare that Boulder families deserve. The Nanny Poppinz system of matching a family to a Nanny in Boulder and Denver is unique. A Nanny agency "Created By Moms for Moms" where we know what Boulder and Denver families want and where we provide the best possible care for Boulder children. Our Nannies are proud to part of our Boulder agency, where we provide professional training and support to constantly improve and enhance their childcare service skills. 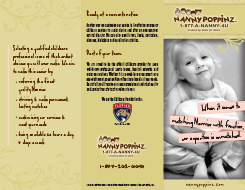 Nanny Poppinz also provides corporate childcare and currently provides stadium childcare to the Miami Marlins. Careful evaluation of individual family requirements, qualified Nanny to meet each specific families childcare needs and schedules whether it is for full or part time, live-in or out, permanent or temporary and even corporate. An experienced Nanny with CPR (or be certified within 30 days of hire for permanent referrals) and First Aid training that are personally interviewed and screened by our agency personnel to meet our stringent requirements. Thorough background checks of each Nanny that is referred to a Boulder and Denver family. No upfront costs until families interview selected Nannies and a confirmed match with a Nanny is made, and only then will a referral fee be charged. Loving, attentive childcare for your children from reliable Nannies who you can trust - so you can work, entertain, travel or have time to yourself with peace of mind. Please give us a call and Nanny Poppinz WILL become your Boulder and Denver childcare service solution. Nanny CPR , First Aid and AED training will be reimbursed by Nanny Poppinz for those Nannies who are hired for part time or full time positions. Please obtain your training locally and keep your receipt. Send the receipt to Nanny Poppinz when you are offered a PT or FT permanent position and you will be reimbursed for your training cost. For information on how to become a Nanny Poppinz Nanny and to schedule an interview please call Dasly at 954-899-3828. .